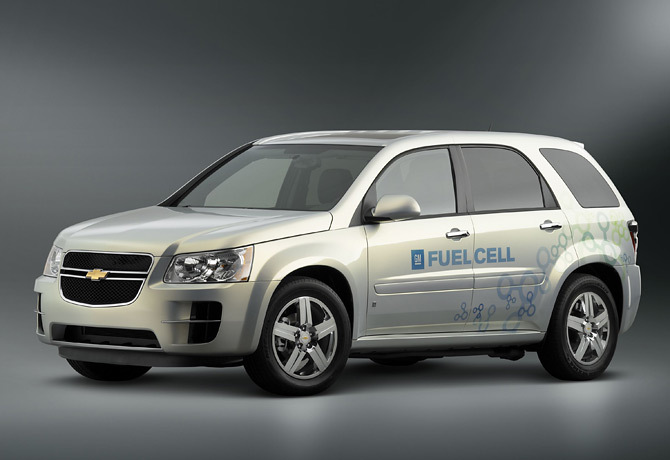 2007 Chevrolet Equinox Fuel Cell Car. No one would mistake Chris Paine for a General Motors shill. In his 2006 documentary Who Killed the Electric Car?, the filmmaker laid out a damning case against GM for unplugging the EV1, the electric vehicle it manufactured in the 1990s and then discontinued in 2003, preferring instead to produce high-margin but gas-guzzling trucks and SUVs. "They were a technological leader, and they fumbled that leadership away," Paine says. Ask him about the U.S. carmaker now, though, and Paine sounds almost admiring. "Their new hybrids are making a difference, and their plug-in technology is a real advance," he says. "GM is making some really good moves now." It's been some time since anyone accused GM of making a good move. The company surrendered its title as the world's top-selling carmaker to Toyota this year, in part because GM underestimated drivers' appetite for leaner, greener cars  a desire filled spectacularly by Toyota's Prius. GM is still weighed down by health-care costs and other legacy issues, but the Detroit giant is finally getting serious about hybrids. After dismissing them for years as a niche unworthy of attention, GM will release an average of one new hybrid model every three months for the next two years, beginning with the industry's first full-size hybrid SUVs late this year. "GM has really stepped up to be the standard bearer for the industry," says Philip Gott, director of automotive consulting for the research group Global Insight. "Toyota stole the limelight the first time with nice technology and a brilliant marketing strategy, but I think GM will take the ball back." In a way, GM never really lost the ball; it just forgot how to play. For all its recent struggles in the marketplace, GM has always been a leader in pure research and development, spending $6.6 billion in the field in 2006. "They've dwarfed the rest of the industry in what they can put into it," says Dan Sperling, director of the Institute of Transportation Studies at the University of California at Davis. In the late 1980s, GM produced concept cars like the Sunracer, a sleek solar vehicle that can still inspire wistful sighs in green geeks of a certain age. But too often the good stuff stalled between the lab and the showroom. "There is a myth out there that GM is a technological laggard, but that's not true," says John DeCicco, senior fellow for automotive strategies at the advocacy group Environmental Defense. "They just chose not to emphasize those kinds of products in their corporate strategy." Nevertheless, GM's cautious approach stranded its brands in the past while its competitors positioned themselves as smarter and greener. Nowhere was that clearer than in GM's foot-dragging on hybrids, which use combination gas-electric engines to reduce fuel usage an average of 45%, according to the National Renewable Energy Laboratory. "Hybrids are an interesting curiosity," said Robert Lutz, GM's vice chairman of product development, in early 2004. "But do they make sense at $1.50 a gallon? No, they do not." Lutz was right then, and even with gas prices closer to $3, midsize hybrids are expensive and may not save most drivers much money. But to consumers, the equation was simple: hybrids = environmentalism. GM just didn't get it. "GM took a gamble that hybrids weren't going to be important," says Eric Noble, president of Car Labs, an auto consulting firm. "That turned out to be a very bad bet." Even while its image became defined by Paleolithic SUVs, GM was quietly making green investments. The company began producing hybrid buses in 2004, using the technology to boost fuel economy on those big, inefficient vehicles where it would have a big, immediate impact. By the same logic, GM has put its first real hybrid engines not in a midsize sedan like the Toyota Prius but in its jumbo suvs, the GMC Yukon and the Chevrolet Tahoe. The 5,000-lb. (2,300 kg) vehicles will run on a new two-mode hybrid system developed by GM with Chrysler and BMW. The power train will use two electric motors  one to assist city driving, one for highways  giving it up to 40% better fuel rates than conventional models' for city driving. "It's a piece of art," says Mickey Bly, GM's director of engineering for hybrid vehicles. And with a towing capacity of 6,000 lbs. (2,700 kg), the fuel economy doesn't come at the expense of power. GM hasn't won over all the skeptics. Sticking a hybrid engine in a jumbo SUV is "putting lipstick on a pig," says Ronald Hwang, vehicle policy director for the Natural Resources Defense Council, who argues that if GM is green serious, it should give up SUVs and build more efficient cars. But other activists welcome the effort. "I'm an equal-opportunity environmentalist, and I'll take carbon reductions where I can get them," says DeCicco. They agree, however, that GM passed up a chance to cement its green rep by failing to support efforts to tighten the federal corporate average-fuel-economy standards. Green darling Toyota has also opposed the proposed new rules, which call for a 35 mpg. (6.7 L/100 km) standard by 2020. The best way for GM to answer its critics is with a green leap forward  and the company is working with every available technology. GM presented the Chevrolet Volt  a plug-in hybrid that can run on battery power, biodiesel or gasoline  as a 2007 concept car. The company will soon roll out Project Driveway, a consumer test of more than 100 hydrogen-fuel-cell cars, which convert hydrogen to energy and produce no harmful emissions. "No other company has such a broad array of green technology," says Tom Stephens, GM's vice president for global power train. "I intend to lead on this."